Snow Lilly’s short stint as the Zoo’s Groundhog’s Day “polar bear representative” has ended… because Gordy the groundhog is taking over! 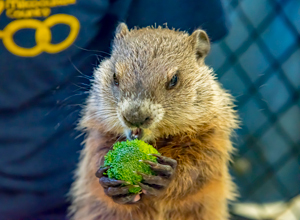 The Milwaukee County Zoo welcomes Gordy, a male groundhog, to the Northwestern Mutual Family Farm! 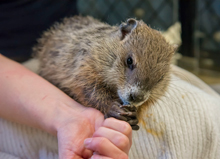 He is the Zoo’s first male groundhog since Waldo in 1996. Born April 5 at the Lost River Game Farm in Orleans, Indiana, Gordy is about 11 weeks old. His favorite foods include: apples, carrots, fresh broccoli, green beans, greens, pears, rodent chow and timothy hay. Gordy receives young guinea pig pellets, as well as two tablespoons of strawberry banana yogurt for extra calories and protein. Currently, he weighs approximately 3.5 pounds. Full grown, groundhogs can weigh up to 12 pounds. That means Gordy is almost one-third of his adult weight! Known as diggers, groundhogs excavate tunnels and burrows underground. These burrows can range from 8 to 66 feet long, containing multiple chambers, levels and exits! Each chamber or level is dedicated to a different purpose. One level is for hibernating from October to March and another level is a “summer home,” which is easier for the groundhog to come out of. One chamber is dedicated solely as a bathroom! Gordy is a great addition to the Family Farm. He loves his plush toy that looks like a dog bone, which he carries around and wrestles with under supervision. Can’t wait to meet him? Once he has the necessary transport carrier, he will be out for keeper presentations! Gordy is an animal that kids will be unable to touch, but they will be able to learn lots of unique and valuable information about groundhogs! Presentations are daily (during the summer) in the Stackner Animal Encounter Building in the Family Farm at 10:30 a.m., 11:30 a.m., 2:00 p.m. and 3:00 p.m.